In rowing travel circles, this event is legendary. How could it not be? Imagine Venice without motor boats for a morning. 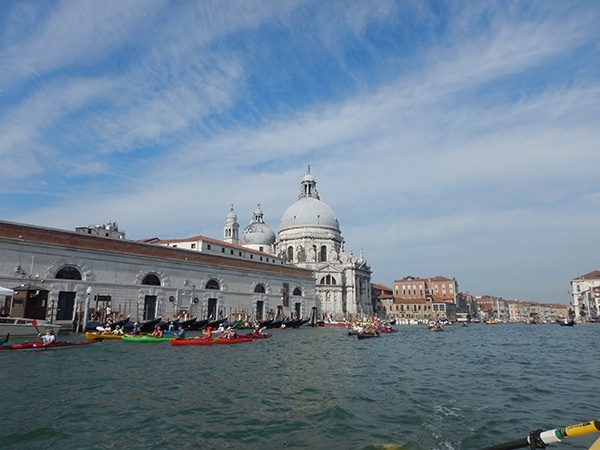 Thousands of rowed or paddled watercraft take to the waters for a 30 km “race”, which begins with a cannon shot from St. Mark’s Square. 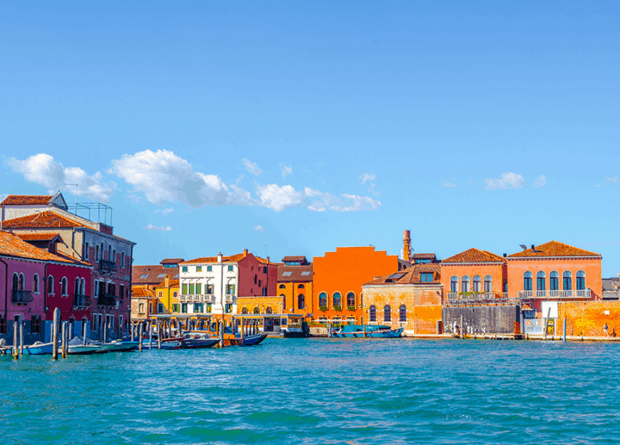 The route takes rowers through the lagoon to Burano, down to Murano and back along the famous canals to St. Marks to receive a participation medal. Rowers come from around the world, with quads, eights, various Venetian style rowing boats, plus kayaks, canoes, SUPs and anything else that moves forward with oars. Join us for a unique weekend in Venice and claim your Vogalonga story. Everyone has one. If you would like to join the race in 2019 (or get a head start on 2020) please contact us. Also consider a longer trip in this beautiful region. Spend the week before rowing the Adriatic Sea & Venetians Lagoons to arrive in Venice on the Friday of the Vogalonga weekend. Note that more boats may become available, allowing a larger groups size. Be sure to be on the waiting list! We have a coastal double available, but requires an experienced bow person – contact us if you are interested. 3 days/2 nights with one day of rowing. We meet in Venice! How romantic is that?! Check into the hotel and join us for our welcome dinner. Yes, you can have prossecco and pasta if you wish. The official start of the Vogalonga is at 9 am. An early start is needed to have coffee and breakfast, launch the boats and row to St. Mark’s. A cannon starts the rowing! 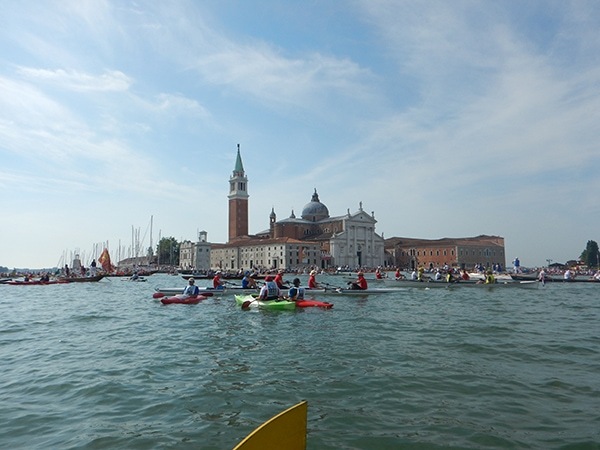 Of we go with about 1,800 other rowing shells, mascarete (traditional Venetian rowing), kayaks, canoes, stand-up paddleboards. 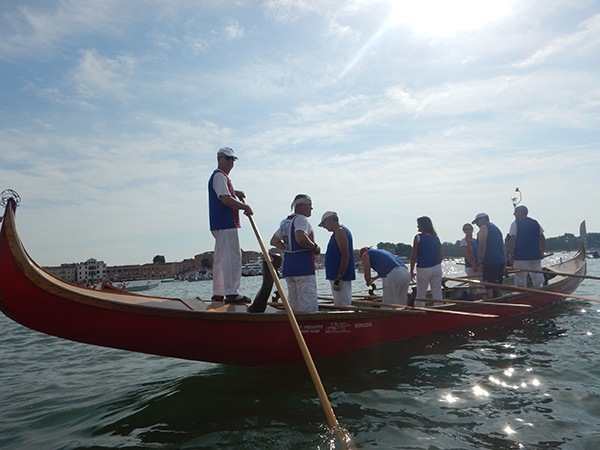 Each of our four boats will row at their own pace, being sure to take photos and enjoy the experience as you traverse lagoons and row through the canals of Burano and Murano. Following the distinctive Venetian route markers is essential, otherwise you might end up stuck on a sand bank! The grand finale is a return to the main island, into Canoreggio. 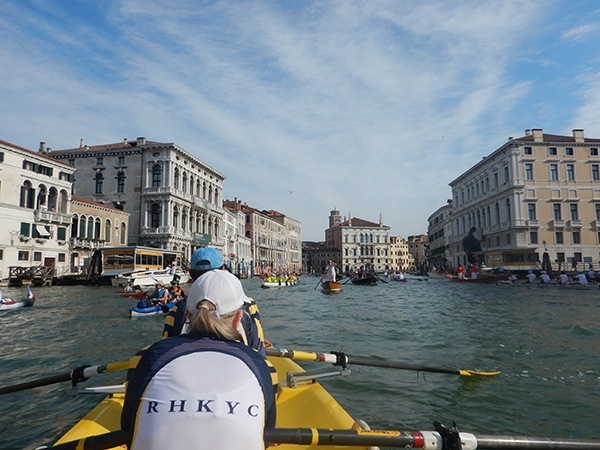 It gets really congested now as you row back to St. Mark’s and the finish line where you will receive your participation certificate and medal. Then a final row to Lido where helping hands will be waiting to help lift the boats from the water. Time to celebrate that evening with our final dinner. Congratulations! Linger in Venice for as long as you want. As you take the ferry back to the mainland, give a wistful glance to the busy waterways, and remember what it was like when rowing ruled these waters!